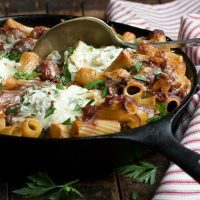 Rigatoni pasta, tossed with low and slow cooked beef brisket ragu and baked up with ricotta cheese. Trim the beef brisket of any excess of fat, leaving about 1/2 inch or so on the meat. If your brisket is too large to fit flat in to your Dutch oven, cut in to two pieces so it will fit. Otherwise, leave as one piece. Season the beef with salt and pepper. Heat the olive oil in a large oven-proof Dutch oven pot (with a lid) over medium high heat. When the oil is hot, brown the meat on both sides, about 5 minutes per side. Remove the brisket to a plate and set aside. Reduce heat to medium under to your pot. Add the onion, garlic and carrots to the same pot and cook, stirring, until fragrant and beginning to brown, about 3-4 minutes. Add the flour and the tomato paste to the pot and cook, stirring for 1 minute. Add the balsamic vinegar and cook, stirring and scrapping the bits off the bottom of the pot, until the balsamic is almost completely evaporated, about 3 minutes. Add the red wine and increase heat to medium-high. Bring the mixture to a boil, then reduce the heat to medium and simmer until it's reduced by half, about 5 minutes. When the wine has reduced, add the hand crushed tomatoes and the beef stock and stir to combine. Add the beef brisket back to the pot. Add the fresh herbs and red pepper flakes and gently stir in to the sauce. Season with a bit of salt and pepper. Bring the sauce to a simmer over medium high heat, then cover the dutch oven and transfer to the preheated 325 F. oven. Cook covered for 3 hours or until the beef is very tender. Remove pot from oven and place on the stove-top over medium-high heat. Carefully remove the brisket to a cutting board. Allow to cool a few minutes, then use two forks to shred the meat, discarding any bits of fat. Add the shredded beef back to the pot with the sauce. Bring the sauce to a boil, then reduce heat to medium-low and allow to simmer uncovered until reduced and thickened, about 30-45 minutes. Taste sauce and add additional salt and pepper, as needed. While sauce is simmering, cook the pasta, according to package instructions, until al dente. Drain the pasta and place in to a large bowl. When sauce is ready, add the amount of cooked ragu specified in the recipe to the cooked pasta and toss to combine. (Refrigerate or freeze additional ragu right away). Spoon in to a greased 10-inch skillet or similar sized baking dish. Prepare the ricotta mixture by combining all the ingredients. Spoon dollops of the ricotta mixture over-top, then sprinkle with grated mozzarella. Bake in 425 F. oven for 20-25 minutes, or until bubbling and golden. Serve sprinkled with the chopped parsley and topped with shaved Parmesan cheese. Notes: The Beef Brisket ragu recipe will make much more than you need for one 10-inch skillet dinner. The rest can be frozen for another meal later! OR, if you're feeding a crowd, double the remainder of the recipe, use all the ragu and cook up in a 9x13 casserole dish instead.